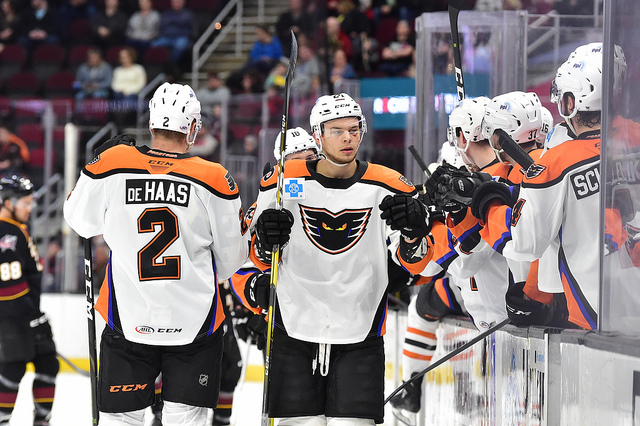 Cleveland, Ohio – The Lehigh Valley Phantoms (33-28-7) received goals from Byron Froese (4th with Lehigh Valley), Carsen Twarynski (7th) and Colin McDonald (9th) but Cleveland’s Zac Dalpe recorded a hat trick for the host Monsters who won 6-3 on Friday night at Quicken Loans Arena. 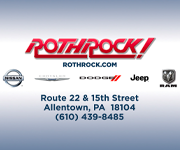 Lehigh Valley’s four-game point streak (3-0-1) concluded in the second game of a five-game road-trip. 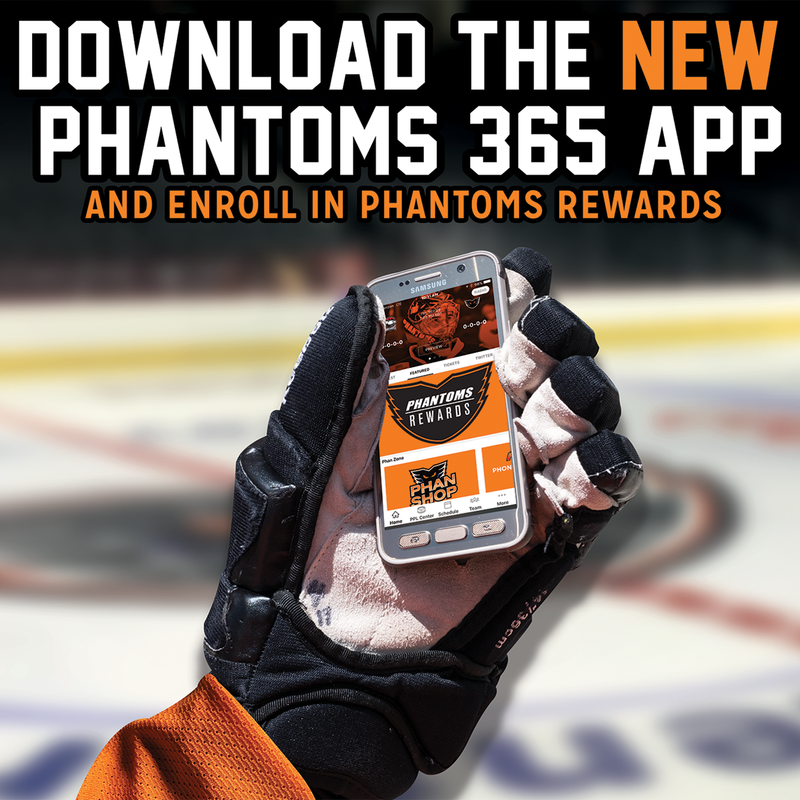 The Phantoms were without two key forwards in Mike Vecchione and Tyrell Goulbourne who had both taken recent injuries. Cleveland (34-26-8) extended its own point streak to six games (5-0-1) and moved to fourth-place in the North Division standings. 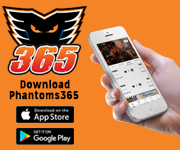 The Phantoms remain six points back of the Hershey Bears for the last playoff spot in the Atlantic Division with eight games remaining in the regular season. Lehigh Valley took a 2-1 lead in the first period after initially trailing 1-0 on Dalpe’s first of the night from the slot. Byron Froese lifted the stick of Mark Letestu in the right circle and offered a quick shot to beat Brad Thiessen and forge a 1-1 tie. Later in the first, it was Froese from the benches who connected on a timing play with Twarynski streaking up the middle. The 20-year-old rookie, Twarynski, powered his breakaway opportunity through the right arm of Thiessen for a 2-1 lead. But Cleveland responded at the end of the first period with Dalpe’s deflection goal in the slot off a right-point shot by Clendening. The hats came flying for Dalpe on his 29th goal of the season early in the second period with a snipe over the shoulder of Phantoms goalie Mike McKenna for a 3-2 lead. 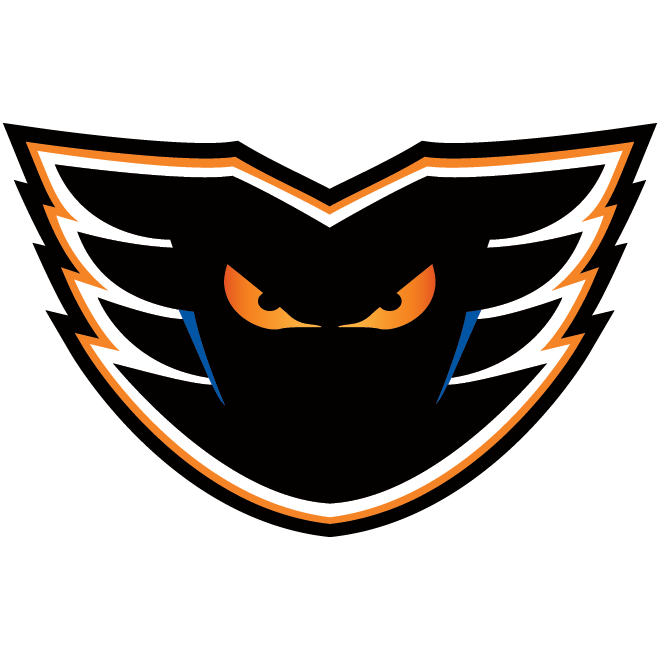 Kevin Stenlund scored on a breakaway to extend the lead to 4-2 but the Phantoms offered another quick response when Colin McDonald scored his first goal as a father on a snipe from the right circle to pop the water bottle over the left shoulder of the Monsters goalie. McDonald and wife, Lexi, welcomed their first child, Ryleigh Noel, last Thursday afternoon. 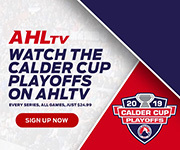 Brett Gallant’s breakaway goal less than one minute later provided Cleveland with a 5-3 advantage into the second intermission and Derek Barach scored his second as a pro on a mini-breakaway in the third period for the 6-3 final. The Monsters out shot Lehigh Valley 41-29. The Phantoms were 0-for-4 on the power play while holding Cleveland to 0-for-3. Lehigh Valley and Cleveland will wrap up the season series on Saturday night at 7:00 p.m. at Quicken Loans Arena. The Phantoms road-trip concludes on Tuesday and Wednesday nights at the Charlotte Checkers who are the top team in the American Hockey League. 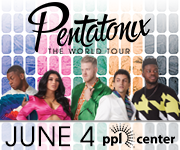 The Lehigh Valley Phantoms return to PPL Center on Saturday, April 6 at 7:05 p.m. and Sunday April 7 at 3:05 p.m. with a pair of rivalry showdown games against the Wilkes-Barre/Scranton Penguins. College hockey hits the ice at PPL Center this weekend with the Midwest Regional of the NCAA Hockey Tournament on Saturday afternoon and evening. The 4:00 opener features the 1-seed and defending national champion Minnesota-Duluth Bulldogs taking on the upstart Bowling Green Falcons. Flyers draft selection Noah Cates had a strong freshman season for Minnesota-Duluth and could be a future Lehigh Valley Phantom a couple seasons down the road. 1st Period-1, Cleveland, Dalpe 27 (Simpson, Clendening), 3:29. 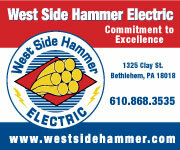 2, Lehigh Valley, Froese 18 4:05. 3, Lehigh Valley, Twarynski 7 (Froese, Kase), 16:15. 4, Cleveland, Dalpe 28 (Clendening), 19:08. Penalties-Collins Cle (cross-checking), 4:29; Laberge Lv (hooking), 4:51; Cross Cle (tripping), 8:56. 2nd Period-5, Cleveland, Dalpe 29 (Clendening, Simpson), 5:28. 6, Cleveland, Stenlund 14 (Letestu), 13:33. 7, Lehigh Valley, McDonald 9 (Bardreau, Swavely), 15:20. 8, Cleveland, Gallant 2 (Vigneault, Somerby), 16:18. Penalties-Thurkauf Cle (roughing), 3:20; Aube-Kubel Lv (hooking), 10:24; Cross Cle (high-sticking), 18:00. 3rd Period-9, Cleveland, Barach 2 (Dalpe, Sherwood), 3:45. Penalties-Carey Lv (slashing), 13:01. 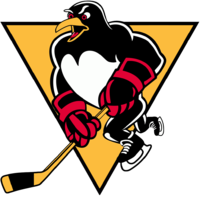 Shots on Goal-Lehigh Valley 15-6-8-29. Cleveland 20-12-9-41. 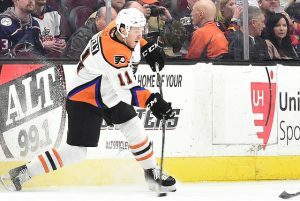 Power Play Opportunities-Lehigh Valley 0 / 4; Cleveland 0 / 3. 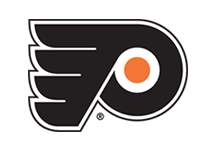 Goalies-Lehigh Valley, McKenna 7-7-0 (41 shots-35 saves). Cleveland, Thiessen 9-5-2 (29 shots-26 saves). Referees-Alex Garon (64), Andrew Howard (50). Linesmen-Zach Roberts (15), Ray King (55). 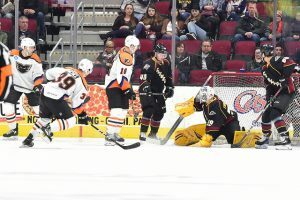 NEXT TIME OUT: The Lehigh Valley Phantoms continue their road-trip on Saturday night at the Cleveland Monsters and then Tuesday and Wednesday nights at the Charlotte Checkers.